Fuel creativity, find new opportunities, make confident decisions and drive operational efficiency. Insights are great, but getting to the right insights, and what you do with those insights, is what matters. It’s not enough to just have "beautiful reports” and pretty visualizations. Your analytics solution has to give you the confidence to make your plans, answer your questions, and surface related insights from questions you didn’t even know you should ask. But why stop there? Operationalize your insights back into your business processes. Monitor results with automated alerts, deploy predictive models that score your data against intended outcomes or use decision optimization that tells you, at the point of impact, just what to do. Governed analytics on an enterprise platform you can trust and access from anywhere. 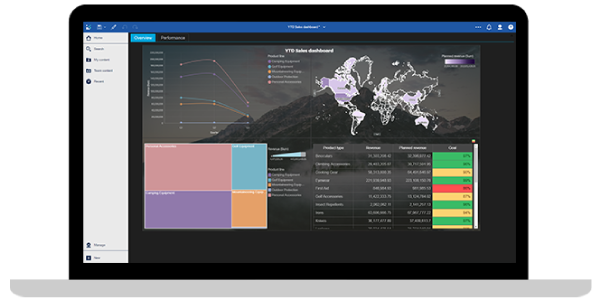 Gain insights based on advanced analytics and visualizations, with automated reporting beyond the limits of desktop BI. Look beyond what you know, without bias. Uncover patterns based on algorithms (not human opinion) to find the real drivers. Access your data or extend to new sources (weather, social, geospatial). Self-service planning gives your teams the tools they need to steer your organization in the right direction. Gain insight across all your data sources in an intuitive and engaging experience and be confident you can trust what you see with governance in your analytics. Uncover why things happened with deeper, unbiased insights in mere minutes. Find the right triggers in and outside your view without the need for coding skills. Automate your manual processes and connect financial and operational plans. Quickly adapt plans, budgets and forecasts and perform detailed, what-if analysis. Discover patterns in data and anticipate what is likely to happen next; collaborate with data scientists to operationalize with machine learning to deliver faster, better business insights at scale. Mitigate risk, save time and increase the opportunity to grow your business by up to 617% ROI with IBM Cognos Analytics. Monitor, explore and share insights from your data within and outside your organization with complete confidence. IBM Cognos Analytics represents the next phase in the evolution of business intelligence by reframing what’s possible for IT and business users alike. Learn how IBM Planning Analytics helps you align plans and budgets with corporate objectives linked to operating tactics and market events. BlueHill Research explains how IBM Cognos Analytics and IBM Watson Analytics are closing the gap between Data Discovery and Enterprise Governance to maximize the value of insightful and predictive analytics for enterprise data. Watson Analytics empowers everyday people with visualizations to quickly uncover new relationships, test correlations and develop new outlooks on your business. In order to deliver a top-notch on-campus experience, MSU Residential and Hospitality Services uses IBM Business Analytics to understand how students and guests use its facilities, helping it fine-tune operations. See how IBM Analytics helped Jabil Circuit improve their forecast accuracy by 18%. Working with Data41, Hunter Industries delivers actionable insight into company finances to support strategic decision-making, while minimizing manual workload.